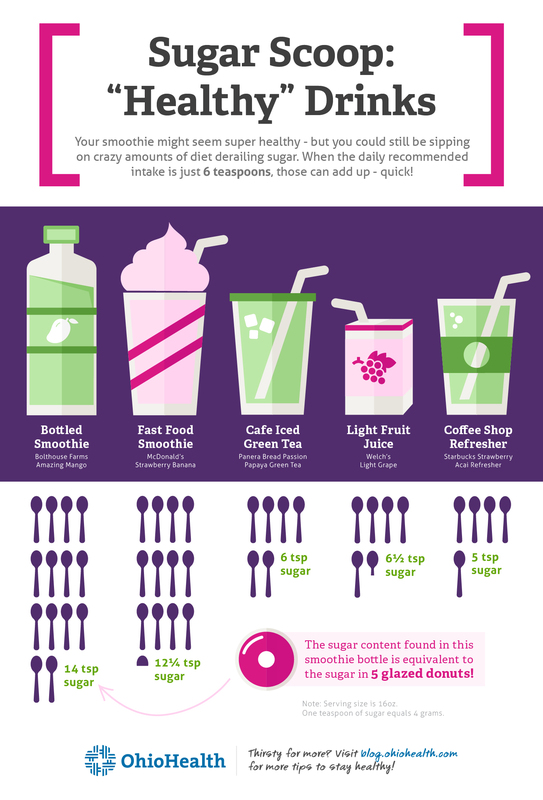 Your smoothie or cold pressed juice might sound like a super healthy choice – but sugars could be sneaking into your diet without you realizing it. We’ve got the sugar scoop. Smoothies, juices, teas… they all sound healthy, right? They’re not carbonated, they have fruit and water in them…. it’s not like they’re a can of soda. But part of making healthy choices isn’t just about eating what sounds healthy, but rather being an informed consumer. That can start by researching what’s inside your favorite healthy beverage – before you take that first sip. Even if you’re driving through a coffee or smoothie shop, you can still research online before you go… or if you’re in the store, just flip that bottle or container around and check out your nutrition label. Why? Because something as innocent sounding as a smoothie can have the sugar equivalent of FIVE GLAZED DONUTS. That’s 14 teaspoons! And according to the American Heart Association, women should keep their daily added sugar intake to 6 teaspoons. Nothing like more than doubling that with one bottle. If you are picking up a beverage with a nutrition label, be sure to check your serving sizes. Many times, you’re getting two servings in one bottle – which means you’ll have to double that sugar count you see on the label. There’s nothing wrong with enjoying a sweet sip, just make sure you know what you’re drinking and the impact its ingredients can have on you. That’s a great way to make the healthiest choice for you!! Want to learn more about sugar? Learn more about the different kinds of sugar that could be sneaking into your favorite foods.